I was recently given the opportunity to try out three products by Vapour Organic Beauty. I was super ecstatic - I am not only a makeup fanatic, but I also adore anything natural and/or organic. While I haven't switched to completely natural and organic products, I do think it's important to pay close attention to what chemicals we're putting on our skin every day. Finding a brand that combines innovative and luxurious products with healthy ingredients is like finding a goldmine! 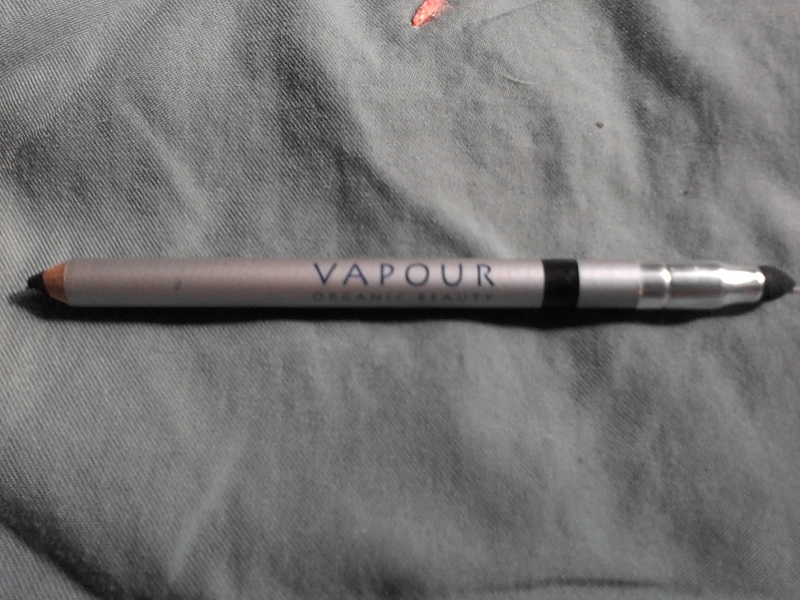 Vapour is a company that combines luxury products with pure, natural ingredients. They feature waterless formulations and light reflecting technology. The ingredients they use are 100% natural, 70% certified organic, and 30% vitamins and minerals. They are free of nasty chemicals, parabens, and animal cruelty! 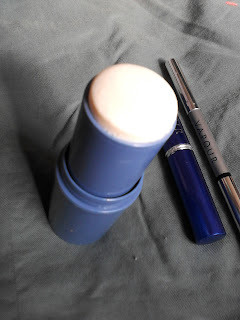 They were kind enough to send me three full sized products to try, and now that I've been using them for a couple of weeks, I am ready to share my thoughts on them! The three products I received are, from the bottom: Stratus Instant Skin perfecter, Trick Stick professional illuminator, and Mesmerize eyeliner with smokey eye tool. The stratus instant skin perfector is a very interesting product. They call it their most revolutionary product, and also the original organic BB cream! It is definitely different than any product I've ever used before. It is a 3-in-1 moisturizer, primer, and no-color foundation. It's designed to give flawless skin without color coverage! It brightens the complexion, evens the skin tone, and has anti aging effects. It comes in 3 shades, but all are basically colorless and just contain different tones suitable for certain skintones. I got 902, which is the lightest. It's best for light to medium skin with pink undertones. This product has impressed me! It glides on the skin and makes it feel instantly soft and smooth. It leaves a dewy finish. While there is no coverage, the slight luminous effect (without being actually glittery) makes my skin look more even and radiant. This is wonderful for a day when you want your skin to look its best without coverage, and it also goes well under foundation! It was made to either wear alone or pair with their atmosphere foundation, which I am very interested in trying next! The trick stick professional illuminator is just what it sounds like - an illuminator! 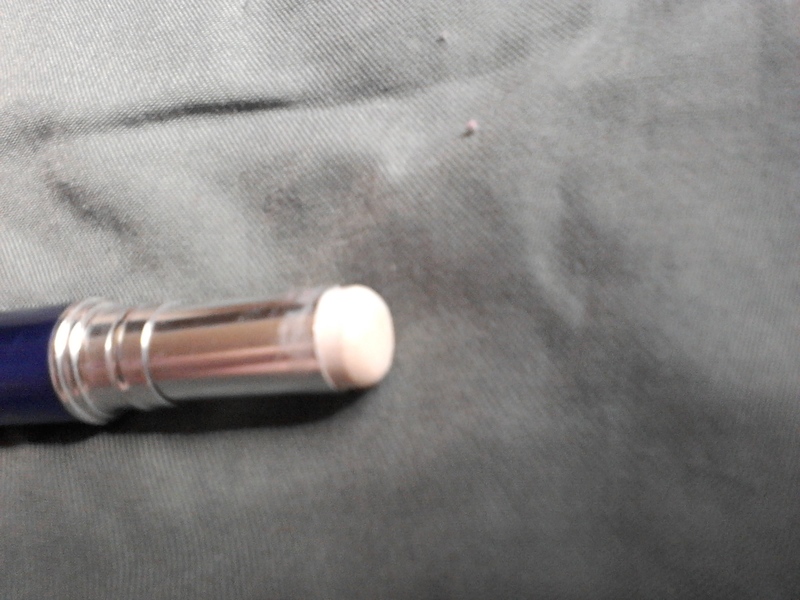 It's a great little highlighting stick that is available in four subtle colors. I got star, which is a platinum. This highlighter goes on nice and subtly, and is truly foolproof. I love it on my browbone and cheeks, as well as the inner corners of my eyes. I normally use a powder highlight, and I have found that I prefer this! It goes on much more subtly and is easy to build without overdoing the glow! 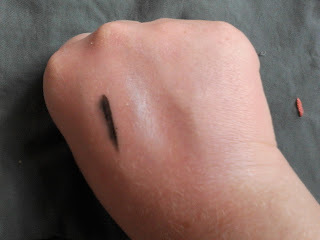 And finally, the mesmerize eyeliner with smoky eye tool. This is a nice, creamy black liner that goes on smooth and precise. I love the included blending tool - it works perfectly to smoke out the line or even just soften it! The liner is soft enough to go on without pulling, which I appreciate. I've been using it daily since I received it! A black liner is a pretty simple thing, but sometimes it's hard to find a good one. Here are all three items on the back of my hand. The liner is on the left, the trick stick is in the middle, and the stratus is on the right. 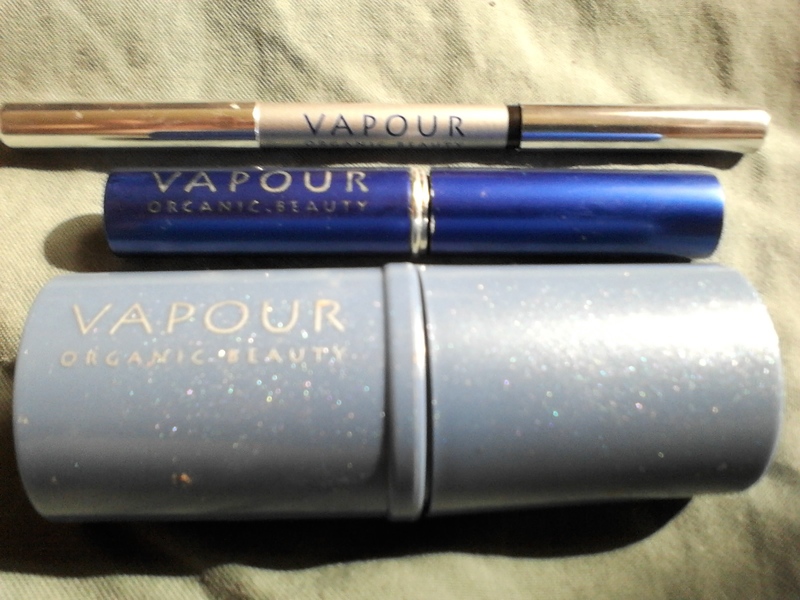 This was my first experience with Vapour Organic Beauty, and I have to say I am very impressed with the items I received! I can't wait to try out more products. If these look good to you, you can learn more about and purchase their products on their website. Disclaimer: I was given products free of charge to review. 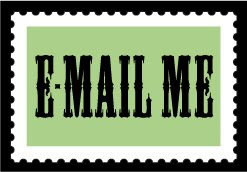 I was not required to post a review, nor was I compensated for doing so. All opinions are my own. I'm liking that the BB Cream is in stick form I think that's pretty unique. The highlighter reminds me of Watt's up by benefit!